Breaking news, as we sidle towards 2019, feeling apprehensive: Fianna Fail and the SDLP are “poised to announce a phased process leading to their integration”! Bet that caught you on the hop, if you’ve been living in an underground cave for the last ten years. And note the delicate phrasing: “poised” – haven’t done it yet but should be soon-ish. “Phased process” – it won’t be a single act, it’ll sort of grow and develop like a geranium or maybe a daffodil, although probably not as quickly. 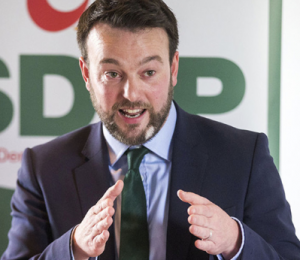 “Leading to” – this process, presumably when it does get completed, will lead (by a road of indeterminate length) to a door marked “Integration”, at which point Fianna Fail will have swallowed and completely digested the SDLP – or the members of it that, unlike Claire Hanna, have stuck around to be swallowed and digested. It seems that the top brass in Fianna Fail and the SDLP haven’t been talking to those lower down the food chain – in fact they’ve been carefully keeping it a secret. Micheál Martin and Donegal TD Sean McConalogue are in on it, as are SDLP’s leader Colum Eastwood, along with his faithful deputy Nicola Mallon. But don’t tell anyone, OK? At least not until the FFers have their Ard-Dheis in February, when Colum and Nicola will be rolled out, so to say. The first big thing the two parties will do is put their heads together and get “joint procedures” so they’re agreed on all-island policies (or All-Ireland policies, if they’re feeling really daring). Will they run single candidates in the May local elections? Um, wait and see. I think both parties are to be congratulated on having pulled this totally-unexpected rabbit out of the hat on the brink of 2019. Mergers are always a tricky business (when the Ulster Polytechnic merged with the New University of Ulster, one unkind UP colleague described it as “like being strapped to a corpse”.) But of course this won’t be the case, since both Fianna Fail and the SDLP are both in rude good health. The SDLP may be a bit cadaver-like, but that’s only because it’s been slimming down in recent years, making itself lean and mean. And my goodness, won’t they and the FFers be a force to be reckoned with around places like the Bogside and West Belfast and South Armagh, when they do merge! And did I mention? 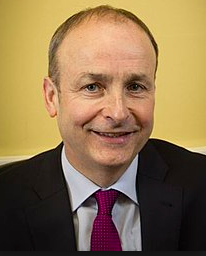 The new party will be called ‘Fianna Fail’. Now that’s what I call a merger.